Tonight Alexander finally got his cooking groove together and made dinner. 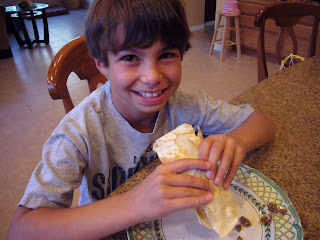 After throwing around several options, he chose to make a burrito. Actually, his first choice was a taco, but alas, we were out of shells. 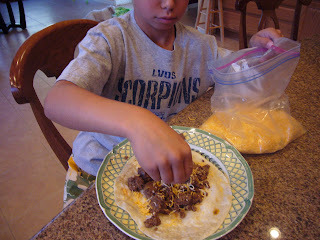 So here he is, in action, making his burrito. 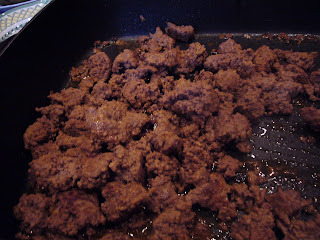 He allowed me to assist by cooking the meat, since he was busy blowing up water balloons (more about that tomorrow). 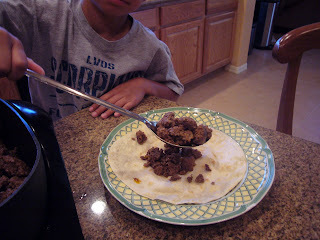 First, he spooned the meat onto the tortilla. Then, he sprinkled shredded cheddar/monterey jack cheese over the meat. 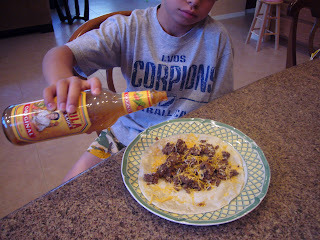 Next, several drops of Cholula Hot Sauce - his favorite. Finally, roll it up and eat it! The picture of his dessert is here. I am happy to see that you are back in the kitchen cooking! I don't think that there is anything better than a homemade burrito!